A hostage crisis at the Discovery Channel building has ended with the attacker shot dead, and pundits and reporters are rushing to label him a “radical environmentalist,” “eco-terrorist,” and “environmental activist.” Some are even saying “eco-fascist.” And others are pointing to the Earth Liberation Front. For talking heads, it is a good soundbite for pushing their political agenda, and for the press is makes a sexier headline, but the label just doesn’t make any sense. Is “radical environmentalist” a more acceptable rush judgment than saying someone was insane? Because that’s the first, and only, thing that has come to mind in this case. I’ve read countless communiques and justifications by radical groups about their actions, and whether or not you agree with them, you can at least follow some string of reasoning. The target has some connection to the radical beliefs they espouse. In this case? It seems to be the result of personal obsession divorced from reality. So could some of the right-wingers and mainstream reporters covering this please make the same connection in this case? Is there a movement against the Discovery Channel I am unaware of? Are there other eco-terrorists outraged by “Dirty Jobs” and “Future Weapons”? I do not intend to make light of this situation or the fear instilled in those hostages. 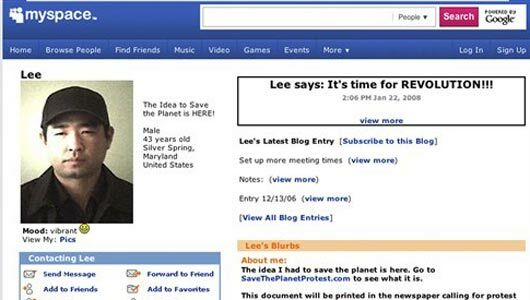 However, as this issues spirals out of control, could one of these talking heads please stop and help me connect Lee to something, ANYTHING, except the local homeless shelter?